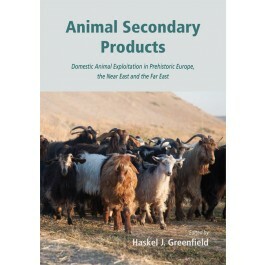 Animal Secondary Products investigates domestic animal exploitation and the animal economy from the Palaeolithic to the Bronze and Iron Ages across Eurasia (Europe, Near East, Siberia and China). Incorporating current zooarchaeological theory and cutting-edge methodological developments, it critically assesses Andrew Sherratt’s concept of a Secondary Products Revolution that proposed that a package of new subsistence practices and technologies swept across much of Eurasia at the end of the Neolithic, which triggered large-scale changes in economies and settlement across the landscape. This model argues that these changes were associated with a genuine shift from an emphasis upon domestic animals for their primary (meat hide, bone) products to a more diversified exploitation pattern which included their secondary (milk, wool, traction) products. Sherratt’s model attempted to conceptualise the changes between the Neolithic and Bronze Age that dramatically transformed the nature of animal exploitation strategies, cultivation practices, land management strategies, nature of settlement, and political and economic organization in Europe and the Near East that set the stage for the evolution of historic land use and animal exploitation patterns. Though setting the parameters for debate within the discipline for over 30 years, science has moved on and many kinds of new data, methods and techniques have been proposed since then that allow greater insights into these issues. In this volume, thirteen papers present a holistic discussion of Sherratt’s concept and investigate the theoretical development in our understanding of the origins of milking, wool production, transhumance, as well as examining the need for a contextualised zooarchaeological analysis and harvest profiles from various international sites in order to reconstruct the nature of Secondary Products exploitation. It also extends the secondary products concept across the Old World into Siberia and China and back in time to the Palaeolithic with the domestication of dogs. Through reviewing artefacts and textual evidence, the book bridges an important divide by cross-referencing statistical and scientific data with more traditional archaeological techniques and demonstrates the necessity of using many techniques to analyse data before interpreting patterns as exploitation practices. Offering fresh insight into the development of civilisation from the Neolithic and Bronze and Iron Ages in the Near East, Europe, and China, this book will be important for archaeozoologists and prehistorians. a. Some reflections on the origins and intensification of dairying in the archaeological record by Haskel J. Greenfield. b. Other indicators of secondary products exploitation: And the Last Shall Be First by Pat Shipman. a. The Exploitation of Domestic Animal Products from the Late Neolithic Age to the Early Bronze Age in the Heartland of Ancient China by Zhipeng Li, Roderick B. Campbell, Katherine R. Brunson, Jie Yang and Yang Tao. b.	Assessing the archaeological data for wool-bearing sheep during the middle to late Neolithic at Bronocice, Poland by Marie-Lorraine Pipes, Janusz Kruk, and Sarunas Milisauskas. c.	Primary or Secondary Products? : The nature of Capra and Ovis exploitation within the Chalcolithic and Bronze Age levels at Portalón site (Atapuerca Hill, Burgos, Spain by by María Ángeles Galindo-Pellicena, José Miguel Carretero, and Juan Luis Arsuaga. IV. Part III (methodological issues in the application of zooarchaeological harvest profiles and other methods to the study of secondary products). a. Crying over spilt milk’: An evaluation of recent models, methods, and techniques on the origins of milking during the Neolithic of the Old World by Haskel Greenfield and Elizabeth Arnold. c.	The Second Revolution of Secondary Products: Do mortality profiles reflect herd management or specialized production? by Aharon Sasson and Haskel J. Greenfield. a. ‘Til the cows come home’: the Secondary Products Revolution and Mesopotamian art in the third millennium BCE) by Trudy S. Kawami. c.	Herd mobility and secondary product exploitation in eastern Hungary during the Neolithic and Copper Ages: strontium isotope analysis from zooarchaeological samples by Julia Giblin. a.	Zooarchaeology of the Late Neolithic, Eneolithic and Middle Bronze Ages at Vinča-Belo Brdo, Serbia: the 1982 excavations By Haskel J. Greenfield. b. Harvest profiles and thin-sectioning of analysis of domestic taxa from Late Neolithic and Middle Bronze Age Vinča-Belo Brdo: some thoughts on changes in subsistence and seasonality by Haskel J. Greenfield and Elizabeth R. Arnold.